It’s always going to feel bizarre to me when the Milwaukee Brewers are good. That’s because throughout my entire childhood they weren’t. And even worse than being bad, they were boring. It didn’t help that they had no real star players. The Cincinnati Reds were never good or particularly fun but at least they had Ken Griffey Jr. Milwaukee’s player representative in Backyard Baseball 2001 was (wait for it) ... Jeromy Burnitz. Luckily for Brewers fans the team became good (and fun!) by the late 2000s. There was 2008 when trade deadline acquisition Carsten Charles Sabathia single handedly pitched the club to a playoff appearance. Then there was 2011 when Ryan Braun and Prince Fielder helped power the franchise all the way to the NLCS. This is the first time the Brew Crew has been back to semi finals since. And what’s funny is that entering this season the Brewers weren’t supposed to be THIS good or even THIS fun. 2018 was the year of Super Teams after all. Of the six division winners this year only the Braves were a (complete) surprise. The Red Sox, Indians, Astros, and Dodgers were all popular preseason picks. 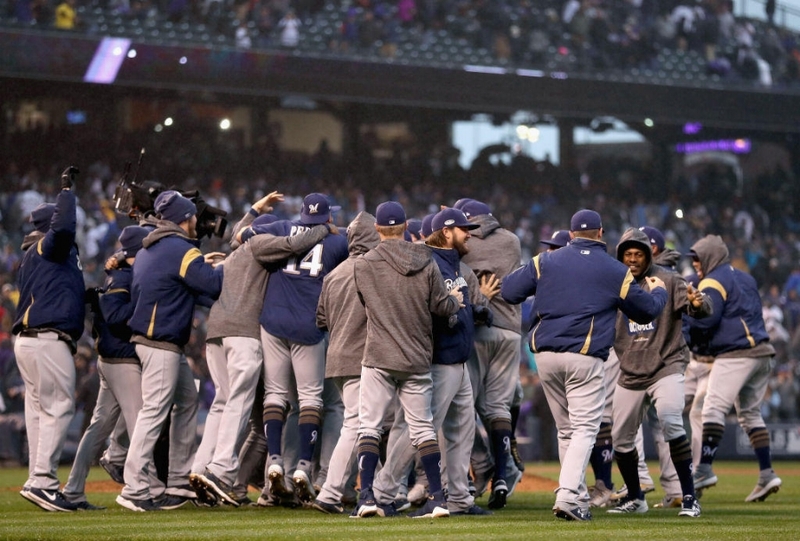 Then there were the Brewers, who needed a Game 163 to win the division over the rival Chicago Cubs. So it was somewhat of a nice surprise to see the Brewers win the division over the preseason favorite. It wasn’t as big of a shock as Atlanta overtaking Washington in the East, but it still isn’t what we expected back in March. Part of the reason Counsell is able to utilize his throwing arms so uniquely is that his team has a lot of really good throwing arms. There’s Josh Hader, who struck out almost 16 batters per nine innings this season. There’s Jeremy Jeffress, whose 1.29 ERA in 76 2/3 IP is the best mark for that high of an inning total since Eric Gagne won the Cy Young award in 2003. There’s the ever consistent Jhoulys Chacín, who started 35 games and posted a 3.50 ERA, including five shutout innings in Game 163 in Chicago. There’s reborn southpaws Gio Gonzalez and Wade Miley. And last but not least there’s closer Corey Knebel. This GIF should be enough of an expiation of his dominance. All this and we haven’t even mentioned Milwaukee’s offense yet, which is led by MVP favorite (AND NEAR TRIPLE CROWN WINNER) Christian Yelich. The Brewers lineup also features former MVP Ryan Braun, the under-appreciated Lorenzo Cain, and fellow mashers such as Jesus Aguilar, Travis Shaw, and company. Like we discussed, this was a year of Super Teams. Milwaukee’s NLCS opponent - the Los Angeles Dodgers - are a Super Team. It’s going to be tough for the Brewers to reach their first World Series since 1982. But if you’re an impartial baseball fan, you may as well root for that to happen. The Brew Crew are scrappy, unconventional, and most importantly fun. They’re the coolest team in baseball.